Vishnu is one of the three Hindu Trinity. 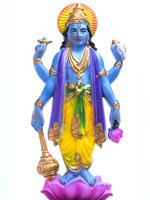 Vishnu is the pinciple object of devotion in the Hindu tradition of Vaishnavism. Vishnu is either worshipped directly or through one of his ten avatar incarnations. The two most popular incarnations of Vishnu are Rama and Lord Krishna. Vishnu is also known as Narayana or Hari. The Vishnu Sahasranama declares Vishnu as Paramatman (supreme soul) and Parameshwara (supreme God). It describes Vishnu as the All-Pervading essence of all beings, the master of—and beyond—the past, present and future, one who supports, sustains and governs the Universe and originates and develops all elements within. This illustrates the omnipresent characteristic of Vishnu. Vishnu governs the aspect of preservation and sustenance of the universe, so he is called “Preserver of the universe”.